OCEAN PARK – The Reverend Doctor Milton Perron Ryder of Ocean Park, Maine passed away peacefully with his family at his side at Gosnell Memorial Hospice House on Saturday, March 30th, after years of battling prostate cancer. “Milt” was born in Brockton, MA to Henry and Harriet Ryder on May 18, 1937. His older brother, Harry, preceded him in death in 2017. After a long distance, six-year courtship, Milt married Helen J. Shupe Sames on June 12, 1988 at an outdoor ceremony in front of their Ocean Park cottage. A previous first marriage proudly resulted in the birth of two children, son Jefferson and daughter Tonda. Jefferson’s marriage to Laura graced him with two grandchildren, Acadia and Nolan. Tonda and her former husband, Patrick Harvey, graced him with two granddaughters, Tessa and Grace. Milt was also blessed with loving family members including brothers and sisters-in-law Marvin and Marilyn Shupe, Kenneth and Missy Shupe, sisters-in-law Joanne Shupe and Faith Ryder, niece and nephews Donna and Bill Bondi, Karen and Charles Stump, Alexander Shupe, Erika Shupe, Scott and Deborah Ryder, Beth and Mark Vincent and 11 great grand nieces and nephews. Apparently, the die was cast with the call to Christian ministry being answered by Milt’s maternal Great-Great Grandfather, Great Grandfather and Grandfather, who were all ordained Baptist Ministers. Also Milt’s paternal Grandfather was an ordained Congregational pastor. Those streaks were expanded to include instrumental music, as Milt studied the clarinet, saxophone and oboe, and performed in brass ensembles and vocal quartets doing gospel team travelling throughout the northeast. Choral singing was also high on his list of joys, performing and touring with his college quartet, the Singing City Choir of Philadelphia, the Portland (Maine) Community Chorus and Portland’s Choral Art Society. These have included concerts and international tours directed by Eugene Ormandy, Ricardo Muti, James Levine, Zubin Mehta, Robert Moody and the Paul Winter Consort. Milt was graduated from Eastern University, then studied for a year at Northern Baptist Seminary, and earned his B.D. from Andover Newton Theological School. He also earned two Doctor of Ministry degrees; one from Moravian Theological Seminary, and the other from Drew University. Through these time periods he was called to several youth ministries, including the Schwenkfelder Church in Norristown, PA; the First Baptist Church of Oak Park, IL; First Baptist Church of Weston, MA; and the beginning of 35 years of leadership with The New England Baptist Youth Conference at Ocean Park. ME. 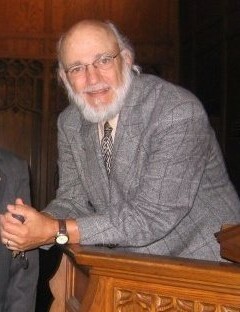 With his heart deeply committed to pastoral ministry, Milt became the Pastor of several congregations: the Antrim Baptist Church in Antrim, NH; the Washington Congregational Church, in NH; the Community Baptist Church in Wappingers Falls, NY; Interim Pastor of Central Baptist Church, Wayne, PA., and in 1982, the beginning of a nearly twenty year pastorate with the First Baptist Church of Boston, MA. Along the way came the invitation to join the American Baptist Churches USA, in Valley Forge, PA. The most important details of those days was Milt’s meeting of and eventual marriage to Helen. Together they traveled and were tour guides through Europe and the UK, participated in three pulpit exchanges with the Broadway Baptist Church in Derby, England, and often operated sixty-foot longboats on the canals of England and Wales. After serving as President of The Conference of Baptist Ministers in MA, he was elected President of the National American Baptist Ministers Council. Most recently he completed 25 years as treasurer of the Conference of Baptist Ministers in Massachusetts. In 2018, he received the esteemed Daniel Sharp, D.D. Award, which is presented to “an honorable Christian in a worthy and faithful ministry”. Milt was an active member of Williston-Immanuel United Church, a merged American Baptist and United Church of Christ ministry, located in Portland, Maine. Milt’s zest for life included being a die-hard Red Sox and Patriots fan. He enjoyed tennis, biking, horseshoes, beach and table games. He had a taste for eclectic art and finding beauty in the strangest places, especially thrift shops. Milt had a knack for turning trash into treasure with “junk sculptures”. He had an extensive collection of CD’s, books, neckties and socks. He had an endless love for all of the pets in his life, especially his current rescue dog and cat, Winslow and Michelin. Special thanks to New England Cancer Specialists and Gosnell Memorial Hospice House in Scarborough, Maine. A celebration of Milt’s life will be held at Williston-Immanuel United Church in Portland Maine on May 18, 2019. In lieu of flowers, donations may be made in Milt’s name to Williston-Immanuel United Church 156 High Street, Portland, ME 04101 and Ocean Park Association P.O. Box 7296, Ocean Park, ME 04063.